Patch & Jacket orders scheduled for TU, May 15, 2018 in HS rm 704 at 2:20. Forms can be picked up from Coach Goldman. Must have full payment for patches. Must pay $100 deposit for jacket order. Congratulations to Sr Girls - 4A- 2 Conference Champs & to Sr Boys - Conference Runner-Up! Great effort from all. Thks to all who helped with the 2018 home meets. 4A State is 5-1-18 @ Pocahontas. Congrats to rhe Panther baseball team on their 4-3 victory over Stuttgart. Next game Thursday vs Baptist Prep. Many thanks to those who helped make the HSHS Last Chance Relay meet a success. Heber is hosting the senior high 4A-2 conference meet on W, 4-25-28. 4A state is at Pocahontas TU, 5-1-18. Congratulations to the 2018 Junior Girl Tracksters for winning Conference W, 4-18-18. Congratulations to Jacob Cantrell for MVP. Thanks to all who helped with the meet, to make a victory possible. 7th Graders have a meet at Cabot on M, 4-16-18. The 4A-2 Junior High Conference meet is at Heber Springs on W, 4-18-18. Senior High Last Chance Relays meet is at Heber Springs on FR, 4-20-18. Track meets: 7th Grade on M, 4-9; Jr high on TU, 4-10; SR high on TH, 4-12-18. Softball game scheduled today vs Cedar Ridge has been rescheduled for Friday April 13th. TF: 7th grade travel to Vilonia, M, 4-2-18; Sr High travel to Cabot TU, 4-3-18; Jr High travel to Cabot TH, 4-5-18. Easter Blesssings from FCA & XCTF. Panther softball with a 14-7 win tonight vs conference rival Riverview. The soccer games today will be played AT HOME. Starting at 5 and 7 still. Our teams will still wear red jerseys and socks. Panther softball game today @ Riverview has been rescheduled for tomorrow. 4:00 start varsity game only. Jr. High Meet FR, 3-30-18, at Heber Springs. Softball game @ Pangburn will begin at 4:00. Panthers compete but fall short to a good Harding Academy Club 6-0! Thursday March 8th @ Conway ‘s City of Colleges Park vs St. Joe. 4:30 start time varsity game only. Week of meets at Heber Springs: M, 3-12-18, 7th Grade, TU, 3-13-18, Jr. High, & TH, 3-15-18 Sr. High. Meets begin at 3:30. If you would like to help at meets or just come & watch, you're welcome. Senior High FCA Sonny Shuttle Relays are TH, 3-8-18, at Heber Springs. Devotion is at 2:30 followed by field events at 3:30, then relays. Come watch the hoss hundreds & medley relays. Panther Basketball pictures tomorrow morning at 7:15 am. Saturday's game vs Mt. View has been moved to 1:00 with Jr Girls in action followed by Sr Girls/Sr Boys. Jacket & Patch orders set for athletes who have completed a senior high season. TU, 11-7-17 at 2:20 in rm 704. Northwestern Sporting Goods. $100 down for jacket; full payment for patches required. Sr B XC team were 4A State Runner-Up: P Ables (1st place, Top Ten, All-State), T Barnes (Top Ten, All-State), L Carter (Top Ten, All-State), B Brown, B Tucker, C Ivener, C Marek, Z Stone, G Simmons. Congrats!!! Heber Springs' Sr G XC team won the 4A State Championship: A Jones (Top 10 & All-State), M Becerra (All-State), S Buffalo, T Hammons, A Duffey, E Riddle, M Vowels, and Rubio. Come see the 2017-2018 Panther Basketball Teams in Action. TU, 10-17-17, XC travels to Quitman on the Cadron Creek Ranch. TU, 10-24-17, XC travels to Bald Knob to race on the golf course. SA, 10-28-17, Jr. High XC travels to Cabot at Central Elementary. 10-7-17: At Bryant, P Ables was 1st and T Barnes 10th. 10-14-17: Hot day at Lake Hamilton's XC meet at Oaklawn. Great effort from all that raced. P Ables was 3rd in the Sr. Boys Varsity race. XC: Great Chile Pepper experience for runners and families. Congrats to Parker Ables - SrV 6th in 15:42. SA,10-7-17, Bryant meet at Bishop Park. Sr.G 9:00; Sr.B 9:45; Jr.G 10:30; Jr.B 11:00. Reminder that the results of XC meets can be found on armilesplit.com. JPM photos and video of the finish line can be seen there, also. : ) to Parker Ables! Ran a 15:48.72 at Russellville on 9-23-17. XC is off to the Chile Pepper this SA, 9-30-17. Sr Boys run at 11:00. Sr. Girls run at 11:30. Next meet is at Bryant on 10-7-17. Had a great time today at Breaking Bread! Couldn't ask for a better group athletes to coach. They are great on and off the field! 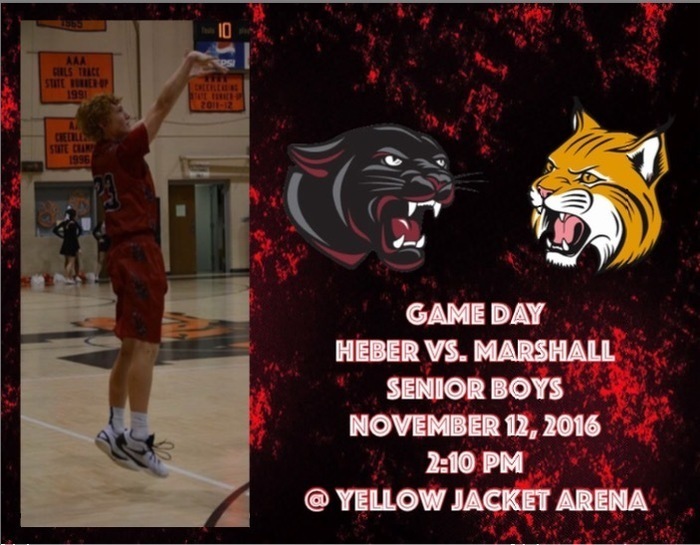 Heber vs Newport today at the Panther Den!! Thursday Sept 14th 8th grade game, vs Greenbrier is cancelled. 7th grade will kickoff at 5:30 and Jr high will follow at 7:00. Cross Country meet TU, 9-5-17, at Melbourne. Mark your calendars! Panther softball ready for camp! Congratulations to Coach Cresswell for being selected 2017 Arkansas Track Coach of the Year from U.S. Cross Country and Track & Field Coaches Association. What a Panther! XCTF: Parent meeting on TH, 8-10-17at 5:30 p.m. in the high school cafeteria. Hopefully this will be convenient since Open House is at 6:00 p.m.
Congratulations to Coach Dale Cresswell for being selected the Arkansas Democrat-Gazette ARpreps Track Coach of the Year for 2017. 🏀Lady Panther Basketball Camp starts tomorrow @ 1:00. Grades K-6th. Track & Field Meet of Champions is SA, 5-13-17, beginning at 1:00 p.m. at Russellville. Several senior boys tracksters will be competing in the Meet of Champs at Russellville. Meet begins at 1:00. Decathlon athletes compete 5-17,18 at Cabot. Good luck to SB, BB, SC at state this TH. Panther Baseball @ Truman tomorrow 1st round of Regional playing Harrisburg 12:30 - Shaw on the bump - lets do this! The senior boys completed their 2016-2017 Triple Crown at Paragould by winning the 4A Outdoor Track Meet held on TU, 5-2-17. This makes 4 Triple Crowns for Heber Springs, Way to go Panthers! The 4A Outdoor State Meet had been moved to Paragould High School. The schedule is still the same, only the location has changed. The senior high track team will be competing at Pocahontas on TU, 5-2-17. 10:30 G: PV, DT, LJ; B: HJ, SP, TJ. 12:30 Prelims &4x800R. 2:30 BPV. 3:30 G: HJ, TJ, SP, B: LJ, DT. 5:30 Running finals. 1. 4A-2 Sr. High Conference Track meet is TH, 4-27-17 beginning at 3:30 at Heber Springs. 2. 4A State Track Meet is TU, 5-2-17 beginning at 9:30 a.m. at Pocahontas. Go Panthers! Senior Boys won the Last Chance Relays at Heber Springs on 4-20-17. 47 schools entered athletes, 900+ athletes, 1300+ entries to events... Go Panthers! W, 4-26-17, Sr. High conference meet @ Heber. Panther Baseball pictures today at 1:30 new gym - We will practice somewhere this afternoon - Go Panthers! Jesse Applewhite has the fastest 800 in the state after racing 4-14-17 at Lake Hamilton. Great job Jesse! Conference meet for Jr. High 4-19-17, Sr. High 4-26-17. Go Panthers! Softball games today vs Newport have been moved to 4:00. Baseball team gets out of class at 1:40 bus rolls at 2 - Headed to Charlotte, Ar V\JV 4:30 - Go Panthers! Panther Baseball @ CHARLOTTE - 225 School Rd - Charlotte, AR 72522 - 4:30 v\jv - NOT AT NEWARK!!! Home Conf dbl HDR 4:00 vs. Riverview - Shaw gets nod on the bump - honoring 1st responders - Go Panthers! Home Track meets this week: M 3-27-17 Seventh Grade; TU 3-28-17 Jr. High; FR 3-31-17 SR. High. Field Events at 3:30, 4x800R ~3:45, other running ~5:00. We can always use volunteers - email us. No softball games today at Tuckerman. Game day Panther Baseball - bus rolls 2:45 - Shaw on the bump - get that Dub! No softball game today vs Searcy due to the rain. No softball game today vs Pottsville due to the rain. Next week the track teams travel to Searcy. The 7th grade on M 3-6, Jr. TU 3-7, and SR. TH 3-9. Field events at 3:30 and running events begin at 4:00. Great turnout for todays Panther Baseball Camp 60+ kids attended - High School Players put on a good camp - heard good things! Heber vs. Clinton Monday is cancelled due to Clinton advancing to the state Basketball tournament - Kid camp Sat grades 1-6 from 9-1 Go Panthers! Lady Panthers in Semifinal action vs Lonoke tonight @ Stuttgart! Good Luck Panthers!! Lady Panthers travel to Stuttgart to take on West Helena. Good luck Panthers!! Last regualr season game for the Panthers! 6:00 tip @ Rosebud! Good luck Panthers!! 2017 Sr. High Football Parent Meeting will be Tuesday, February 21st at 6 P.M. in the Cafeteria. Please make plans to attend. Come out and support your Sr. Panthers tonight at 6:00 for their final home game of the season against Riverview!! Good luck Panthers!! Game Day!! Jr Girls get the action started at 5:00 @ Newport. Super Stoked taking non-basketball Baseballers to UCA to watch a UCA baseball practice - Thank you Admin! leaving at 2:20 get out 2:10 - team building - Go Panthers! Game Day!! Heber vs Mtn. View starting @ 5:00 with jr boys in action. Good luck Panthers!! Game Day!! Panthers vs. Bald Knob starting at 4:00 with Jr Girls. Heber Springs Special Olympics Skills/Drills. A lot lot great athletes on the floor! Great job!! Congratulations on being named to the 2016 All-State Football team Luke McGowan. Congratulations on being named to the 2016 All-State Football team Pierce Mitchum. Game Day! @ Harding Academy. Jr Boys tipoff at 5:00. 7th grade/ Jr High JV travel to Southside Batesville for 4 games tonight starting @ 5:00. Game Day! Panthers take on Cedar Ridge @ The Panther Den. Jr Boys get the action started! 2017 SPRING SPORTS SENIOR NIGHT IS TUESDAY, FEBRUARY 7TH BETWEEN SENIOR GIRLS AND SENIOR BOYS GAMES. Game Day! Jr Girls begin at 4:00!! Good luck Panthers!! (G)🏀 Heber Springs leading Tuckerman at halftime 38-18. Good half of basketball for the Panthers! Congrats to the Jr Lady Panthers on their 43-19 victory over the Lady Bulldogs of Tuckerman!! Game Day!! Jr Girls in action @ Tuckerman 5:00. There are NO 7th Grade/Jr High games at Clinton Monday Jan 16th. 🏀Game Day!! 7th Grade/Jr High vs Quitman @ The Panther Den. 1st game @ 5:00! Good luck Panthers! Game Day! 7th grade and Jr High Boys travel to Rosebud today. Games begin @ 4:30. Basketball games tonight at Riverview has been postponed to a late date. Game Day!! The Panthers will travel to GF Westside for 7th grade and Jr High action. First game begins @ 5:00 with 7th grade girls. Good luck! Game Day: The Panthers take on the Greyhounds of Newport tonight @ The Panther Den. Games start at 5:00 with Jr Boys action. Good luck to the Panthers this afternoon as they take on the Yellowjackets from Mt. View @ 5:15 in the 3rd place game of the Heber Springs Holiday Invitational. Good luck to the Lady Panthers today as they take on Dewitt @ 11:00am in the final day of the Heber Springs Holiday Invitational!! (G) 🏀 Mayflower leading Dewitt 15-13 end of 1st quarter. Heber vs Star City in boys action in the feature game of Day 1 of Holiday Tournament! Lady Panthers take on Star City tonight! Congrats to the Lady Panthers on their OT win against the Southerners!! GAME DAY! Heber @ SS Batesville. 5:00 tip for Jr Girls. Exciting conference matchup! Look forward to seeing you at the game!! Congrats to Sr Boys on the 56-46 win tonight over Mt. View. 3 straight conference road wins for the Panthers!! SECOND ROUND 4A STATE PLAYOFFS! First Round Action Today!! Good Luck Panthers! Senior High XC teams race at State on SA, 11-12-16. Sr. boys run at 11:30 a.m. and Sr. girls race at noon. Go Panthers! God's speed. First round of the SS Batesville tournament tonight beginning at 5:30 with Jr Girls in action followed by the Jr Boys at 6:30. Thanks, S Davis & M Huitt for your work at getting posters for the seniors' parents FR night. Thank you, D Wells, S Logan, & M Willen for the time & effort you put in the production of each poster. Help us celebrate these Sr.'s tonight as they play for a Conference Championship. Kick off 7PM. Tailgating begins at 4. Go Panthers! The Bald Knob XC medalists were: G Lehfeldt, A Jones, M Wilson, T Hammons, J Applewhite, B Smith, T Barnes, L Carter, B Tucker, and G Simmons. Great job! Congratulations to the senior high XC teams for winning the 4A-7A division of the Bald Knob XC meet on 11-1-16. It was an extremely difficult course, but the XC Panthers clawed their way to victory. XC: Senior high has its final regular season race on TU, 11-1-16 at the Bald Knob Golf Course. Sr Boys race ~5:15 and Sr. Girls race ~5:45. State is SA, 11-12-16 at Oaklawn infield in Hot Springs. XC wants to congratulate the junior boys football team and coaches for their 2016 undefeated season. It has been 22 years ago since this was done. Great job! Very Proud of our Jr Panther FB team. 9-0 Conference Champs. Oaklawn race results, 10-22-16, can be found on race-wizard.com. Team results: 1-4A division: Sr. Girls 1st, Sr. Boys 2nd, Sr. B jv 1st. Medalist: Sterling Thomas and Parker Ables. 5Ks coming up: "On a Mission 5k" 11-5-16 at 8:00 a.m. Online registration http://macsrts.com. "Fight Like a Kid 5K" 11-12-16. See Gil Mitchum. Congratulations to the 7th Grade and Jr Panther Football teams. They went on the road last night and beat West Helena Central 22-12 and 36-8 respectively. Go Panthers! XC races at infield of Oaklawn, SA, 10-22-16. Jr. B 9:30, Jr. G 10:00, Top 7 Sr Boys 10:30, Top 7 Sr Girls 11:00, Sr. B 8-below 11:30, Sr. Girls 8-below Noon. XC: Meet at OAKLAWN in Hot Springs, hosted by Lake Hamilton on SA, 10-22-16. Jr. B begin at 9:30, Jr. G 10:00, Sr. B (top 7) 10:30, Sr. G (top 7) 11:00, Sr. B JV 11:30, Sr. G JV 12:00. XC: Monday, Sulfur Rock, medalist were: Grace Lehfeldt, Ali Jones, and Brian Brown. See results on armilesplit.com. Conway XC Meet: Senior boys won. Medalist: Parker Ables, Jesse Applewhite, Lane Carter, Bryce Smith, Millie Wilson, and Sterling Thomas. Great effort by all. Team work is alive and well. XC at Sulfur Rock Elementary Campus hosted by Batesville on Monday 10-17-16. 4:15 Jr B, then Jr G, Sr B, Sr G.
Looking forward to HS softball camp tomorrow! It starts at 9:00 and ends at 12:00. Hope to see you there! Fields of Faith tonight. FBC providing burgers at 6:00 and program will begin at 7:00 at the Panther Stadium. All are welcome. Fields will be lighted up all over the United States tonight. Next XC meet is at Bryant Bishop Park in Bryant. Sr. G 9:00, Sr B 9:45, Jr. G 10:30, Jr. B 11:00. Trenton Barnes placed fourth in the junior boy division of the Chile Pepper Festival 5K XC meet. All runners did a great job! Oct 14th 103.7 the buzz will be here doing their Sonic Blast radio show with Randy Rainwater. It will begin at 4 and go to 7. Come out and be part of the festivities. Did I mention thats also HC. A neat observation at the Russellville XC meet was that three of this year's homecoming court raced at the meet: Sara Davis, Ali Jones, and Maddie Vowels. Go Panthers! Jr. High raced at Sloan Hendrix, TU, 9-27-16. Among the top 15 medalists were Brian Brown, Chase Applewhite, and honorable mention, Sydney Buffalo. Russellville Cyclone XC meet SA, 9-20-16, had some Heber Springs runners among top 20 medalists: Parker Ables, Jesse Applewhite, Millie Wilson, Trenton Barnes, Sterling Thomas, and Taylor Hammons. XC raced at Russellville SA, 9-24-16. Medalist: Parker Ables, Jesse Applewhite, Millie Wilson, Trenton Barnes, Sterling Thomas, Taylor Hammons. It was a challenging meet and good effort by all. XC teams travel to Russellville SA, 9-24-16, to race in the 43rd annual Cyclone meet held at the Old Post Road Park near the Lock & Dam. Jr B 9:30, Jr G 10:00, Sr B 10:30, Sr. 11:15. Congrats to the Sr. Girls & Boys for winning the 4A/5A division of the West Side XC meet on 9-20-16. Trenton Barnes won the Jr. boys race. Parker Ables won the Sr. boys race. Great job to all! The Lady Volleyball Panthers play a conference match tonight vs Riverview. Matches begin at 4:30. Come support the Lady Panthers. HSHS Girls'Tennis Team defeated Cave City 3-2 and the Boys' Team defeated Cave City 4-2. Both teams play Riverview Sept.27th. XC meet at Greers Ferry West Side on TU, 9-20-16, jr boys at 4:15, followed by jr g, sr b, sr g. The course is behind the West Side Gyms. Thank you to everyone who traveled to Greenbrier last night for the Jr. High Football games. It was a very exciting night as the Jr. Panthers improved to 3-0 on the season with a 44-36 victory. Their next game is Thursday September 22 at Panthers Stadium against the Southside Southerners. The 7th grade plays at 5:30 and Jr. High at 7:00. Go Panthers! HS Tennis Teams defeated Stuttgart Sept. 13th. The girls team will play Southside on Thursday, Sept. 15 at the Red Apple Inn Tennis Courts. Josh Park Memorial Cross Country Meet is tomorrow. Jr Boys run at 4:30, then Jr. G, Sr. B, Sr. G. @ Dam Site J area. I would like to thank everyone for the great support for our kids last Friday night. We are truly blessed to live in such a great community. I am proud of how hard these young men played and, even though we came up a little short, we have something to build on. Thursday the Jr. Panthers travel to Greenbrier for a 7:00 kickoff. Prior to that game the Jr. high JV will play at 4:30 and 7th grade will play at 5:30. On Friday, September 16 the Sr. Panthers travel to Searcy to take on Harding Academy, kick-off at 7:00. Go Panthers! Congratulations to the Jr. Panthers as they defeated the Harding Academy Wildcats 30-0 last night. Go Panthers!! TU, 9-6-16, team results of the Melbourne XC Meet: SR. Boys 1st of 7 full teams Sr. Girls 2nd of 5 Jr. Boys 7th of 11 Jr. Girls 4th of 12 Proud of all the runners! Would love for you to make the trip to Clinton tonight to support the Panthers in the Battle of the Little Red. Game time 7:00 Go Panthers! Big win for the 7th grade (8-6) and Jr. High Panthers (22-16) over Clinton. The crowd was awesome. Go Panthers! Battle of the Little Red t-shirts. Hope to have them by Wednesday. It's here the week we have all been waiting for, CLINTON week. Battle of the Little Red! Swat the Jackets! Panther Football September 2, @ Clinton. Rivalry game has now become a Trophy game. The Battle of the Little Red. Please make the trip to support these athletes. GO PANTHERS!!! Come support the HSHS Tennis team at their first match of the 2016-17 year against Harding Academy at 3:30 today on the Red Apple Inn tennis courts. Paige Foree contributing at the net during the varsity match against Midland. Photo courtesy Will Gilbert. Freshman Night - Due to the weather forecast for Thursday night, Freshman recognition night will be postponed until basketball season. Football, Basketball and Cheer will be recognized during the final home game of the jr. high basketball season. More information will given out during basketball season. 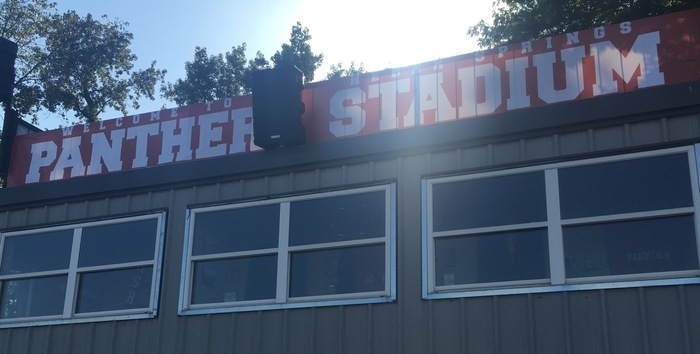 Congratulations Heber Panthers for the win over Southside last night!